Our vacancy dropped a tad bit to 2.56%. Below is a graph that we will publish every so often so that you can see the trends. As I stated before, February was a great month for us. We leased a lot of properties up. Our system creates a report of all properties on notice and vacant. It tracks where we are at on the turnover, any applications, dates for lease signings, etc. 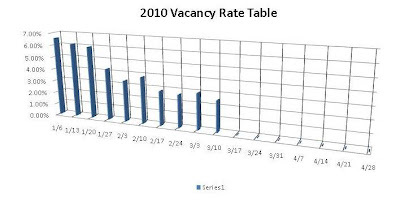 In reviewing this report, I am not seeing as many applications and lease signings scheduled. Hopefully that only indicates an interim slow down. Members of First Rate Property Management along with local members of the National Association of Residential Property Managers went to the State Capital Building on March 9th to fight a new bill that would cause hard ache and added costs to property managers. In summary, we got the bill squashed. We’ll post a summary of the bill and what our arguments were soon. The EPA has new laws concerning maintenance and repair of homes built prior to 1978 coming out in April. On March 8th, Sheila Thomason attended the required education and is now certified. Look for a post soon on how these new laws affect Landlords and the upkeep of your rentals.